Are you considering an upgrade to the exterior of your Pennsylvania home? Aren’t sure which material to go with? You can choose between stucco, siding, engineered wood, fiber-cement siding and stone. Let’s take a look at the stone option for your home. What are the benefits of installing stone siding on a home exterior? There are quite a few and we will look at most of them in today’s post from Ai Restoration. Quite possibly the biggest benefit of installing stone siding on the exterior of your home is the versatility of the stone. You will have more than enough options when choosing the stone you want to install. From style to texture to color; you will surely be able to find an option that meets your design needs. 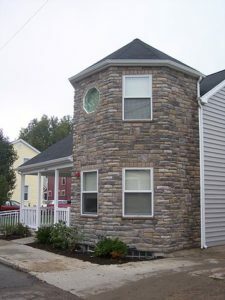 Stone can be placed on all types of homes, including European-style, Georgian, Prairie homes, cottage-style homes, Federal-style homes and many others. When a home has stone on its exterior, it typically presents itself as formal and elegant. The home can even come across as rugged when your contractor uses unfinished stone, which gives the home a rustic look compared to its surroundings. Stone can also be used for just one area of a home’s exterior, such as a wall. The wall is then paired with brick, shingles, or siding in an effort to help the stone portion of the exterior stand out. Using stone on the exterior of your home also comes with some environmental benefits. A home with stone on its exterior will last longer than most other homes. This reduces the need to harvest new materials from the environment to repair or rebuild the home. The environment can also benefit from the use of stone when contractors pick stone from local vendors, reducing the need to transport the material across the country. Stone is one of the most durable materials you can install on the exterior of your home. It can withstand damage from wind, rain, ice, and snow. The stone will also resist fading from direct sunlight. A home with a stone exterior will not suffer rot from rain and cannot be breached by bugs, much like homes with wood exteriors. A home with all stone on the exterior can help reduce the damage caused by fire, limiting the extent of the repairs needed. Are you looking to update the exterior of your home? Are you building a new home? Consider installing stone siding on the exterior of your home. Call the team at Ai Restoration to schedule an appointment to see all the stone options we offer our clients. Call the office at 215-794-6858 to schedule an appointment or complete the contact form on our website.